This is the sermon I preached at St. Timothy Lutheran Church on All Saints' Sunday, Nov. 4, 2018. The text is John 11:32-44. Today we celebrate all the saints. We remember loved ones who are laid to rest. Though they have died, yet they live. And though their work is ended, yet their dream of God’s love for the world is also still alive. We identify with the grief of Mary, Martha and Jesus. We know the reality of death that lies so close, that at any moment the phone call or text could come with news we dread. I felt that way when my daughter Sarah was in the emergency room with blood clots in her lungs. We live forever in the shadow of death. But the thing is, All Saints means all. Being a saint comes as a gift from God. We are saints because of our contact with the Holy God and because the Holy God has come in contact with us. Look around the sanctuary. You are looking at the living saints of God who are also part of All Saints. We celebrate each of you as well. Mary’s beloved brother had died and of course, Mary goes to Jesus in her distress. “Lord, if you had been here, my brother would not have died” (v. 32). Was she reprimanding Jesus because he did not come at the instant he was told that Lazarus was sick? After all, Jesus waited two days longer before making the trip to Bethany (John 11:5) and in that time Lazarus died. Further on it says that Jesus was “greatly disturbed in spirit and deeply moved” (v. 33). That gives us the impression that Jesus was feeling compassion, however, the Greek in this verse and verse 38 has the connotation of anger or outrage. Why was Jesus angry? There are many opinions. Personally, I think there are several reasons. The lack of faith may have been one. Another may have been that death had dared to reach into beloved human life. In the middle of the anger, Jesus began to weep. His tears come in direct response to the invitation to “come and see” where Lazarus is buried. Our Lord Jesus cried in public, because of the pain that death causes in human life. God grieves with us. Now we get to the miracle, which is Jesus’ seventh and final miracle. It also starts the chain of events that will lead to Jesus’ own death. Lazarus was really, really dead. At the time of Jesus, it was believed that the life force of the body stayed in close proximity for three days. So, the repeated statement that Lazarus had been in the tomb for four days stresses that he is beyond all hope of life. Dead Lazarus could do nothing for himself. He could only passively receive the new life God gave him. We see Jesus linking faith to seeing “the glory of God” in the miracle of raising Lazarus. Faith sees God where others do not. Jesus’ prayer is not that of intercession or pleading with God for Lazarus’ life. It is one of thanksgiving, knowing he was heard and that he was doing the will of the Father. Notice that it was also for the benefit of the crowd. Jesus wants to direct their eyes toward God, not toward himself, so that they see God’s glory in the miracle. Earlier in John Jesus said that he does nothing without God and now he demonstrates it. Some in the crowd will get it. Some will misunderstand the miracle and have an improper faith in Superman Jesus. Some will respond by actively seeking to kill Jesus. After that, he confidently commands Lazarus to come out of his tomb. Lazarus somehow walks out of the tomb, which in itself is another miracle since his whole body was bound. Still being wrapped in the grave clothes in which his body was wound for burial is evidence that this was indeed the same person placed in the tomb four days earlier. It is in response to Jesus’ word that Lazarus finds life. It is also in response to Jesus’ word that Lazarus is loosed from his restrictive bindings, but by other people. Not all God’s works happen supernaturally. Sometimes they require our involvement as well. Has Lazarus been raised to everlasting life as Jesus would later be? No. Lazarus was restored to life, but he would one day die again. It is the Lord Jesus who would be resurrected. As usual in John, this miracle has a literal meaning—the raising of Lazarus from death—and a symbolic meaning—the giving of life to all whom Jesus loves. There is physical death and life, illustrated by Lazarus. There is spiritual death as separation from God and spiritual life as connection with God. Both are part of John’s message for us. “Unbind him and let him go” is an invitation to be drawn into God’s life-giving work, to participate in, extend, and in some sense complete the reach of God’s mighty acts. The resurrection promise is not simply a matter of “then,” whether we think of the past like Lazarus’ rising or of the future resurrection at the end of time. It is also and equally a matter of “now.” Now there is something for us to do. Now we find the courage to live amid fear. Now we sense God’s promise of life helping us to not only live in the shadow of death with confidence but also resist the power of death that is all around us (David Lose). We see how much of the world is far from God’s kingdom. We see death’s ability to overshadow and distort lives. It is easy to look at and see poverty and injustice, disease and despair all around. We can quickly become discouraged and depressed. God’s promise of resurrection empowers us to defy death’s threat. Hear again the words of Jesus to us, “Unbind him, and let him go” (11:44). Let Jesus set you free from whatever is keeping you from full communion and a dynamic, living relationship with God. Are the daily disappointments of life, the betrayal of a friend, a failure at work, a difficult marriage, the loneliness and pain of longing for more out of life barriers to your relationship with Christ? Let the people of God unbind you. Clothed in the righteousness of Christ, we are called forth from the grave. Fellow saints rush forward to remove the rotting grave clothes. Together as the people of God, we celebrate the hope and promise of resurrection, rising each new day to serve in the name of the one who is beyond death, the Lord Jesus, our Savior. At the table, we feast with the God in whom we have waited, the God who swallows up death forever. The last word is not death, but life as a beloved child of God. The life God has for us is wonderful, but it is not for us alone. What are we to do about the poverty, disease and despair we see? How can we unbind our fellow humans? Night after night we see the news regarding migrants from Central America making their way to the U. S. We may have different opinions about whether or not they belong here, but nevertheless, they are suffering, and among them are our brothers and sisters in Christ. How can we unbind them? One way is through one of the many organizations working with migrant families. Quite a reliable one is the Lutheran Immigration and Refugee Service. So, what can we do besides sending them money, which is important? We can be equipped with training and resources for congregations from the Lutheran Immigration and Refugee Service. We can become advocates by having accurate and up-to-date information. Misinformation, of which there is plenty, can be countered with common sense facts, accurate statistics and practical solutions. We can contact our legislators with our concerns. Another option is to form an immigration taskforce whereby we can make a difference in our congregation or community with education, advocacy or human care. We can keep each other informed and encouraged, share responsibilities for sustainable efforts and network with other local, regional and national groups. Together we can work to create laws and policies that treat all people with dignity. What about the pain of our local Jewish community in the aftermath of the shootings in Pittsburgh? Our presiding bishop, Elizabeth Eaton writes, “For the Jews, the Sabbath begins at sundown on Friday. We have been invited and encouraged to ‘Show up for Shabbat.’ Now is our opportunity to stand with our Jewish brothers and sisters against anti-Semitic bigotry and hatred. Contact local synagogues and ask how you can help. So, I asked Google about synagogues in our area. What it came up with was a group that meets at the Hurlbut church in Chautauqua, so I called my friend Pastor Carmen Perry, pastor of Hurlbut. She contacted someone from that community who said they had sent some money to the Jewish community in Pittsburgh and she will talk with them more to see what else we might be able to do. If you’re interested, let me know. Today’ gospel passage asks us to reflect on Jesus as the resurrection and the life, not just for the crisis time of death, but for all moments in life. This passage offers a promise about how believers will live their lives, not just about how they will end them. 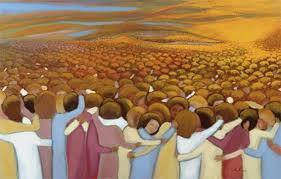 We here are a veritable host of saints who have work to do, a call to answer, a resurrection life to lead here and now. “Unbind him, and let him go!” is our mandate and marching orders. The God who brought Lazarus forth from the tomb, the God who raised Jesus from death, the God who promises us life eternal…this God is not finished yet! And we are the instruments of God’s resurrection life, grace and power here and now.